H x W: 55 in. / 31 in. 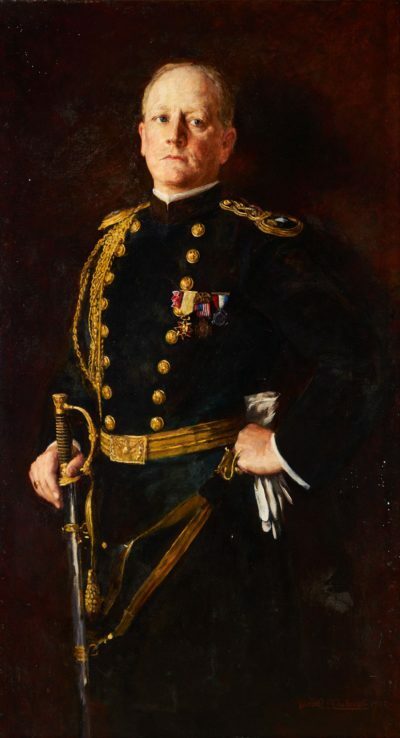 Major Walton served with the United States Volunteers from1898 to 1899 on the staffs of Generals Brooke and Ludlow in Puerto Rico and Cuba. He was later the Defense Attaché at the U.S. Embassy in Paraguay. This painting was executed while he was a Major and donated to the Club by his widow’s estate. Mrs. Walton was the daughter of Medal of Honor recipient General Wheelock G. Veazey. Major Walton and his wife, Annie G. Veazey Walton are buried in Section E-N, Site 1022, Arlington National Cemetery.